In day-to-day world of business, we are continually searching for approaches to enhance our efficiencies and lessen the manual work. A Customer Relationship Management (CRM) framework is a sensible decision. Now the question is What is the Right CRM app for my business?”. Apptivo has business apps for just about everything, but how do you know which ones to use? This guide will help you learn about what are all the online business apps available, and which apps might work best for building business solutions. One of the great parts about Apptivo is that you can select your best business apps which you need right now, even if it’s just a simple solution like invoicing your customers. Some businesses might want a complete end to end solution on day 1, while others may prefer to start with just a few apps, and grow from there. These are our “Lead to Invoice” flows. In general, Apptivo supports five primary business functions: CRM/sales, fulfillment/order management, billing, and support. 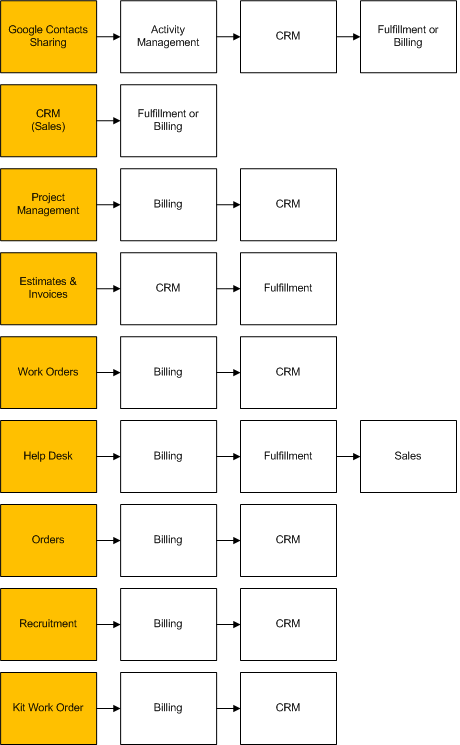 If we mapped out your business process into it’s simplest form, it’d look something like the below image. The specific apps you used to address these needs will change based on the type of business, and we’ll cover each solution with examples below. High Level Flow: track sales, send quotes/estimates, launch a project, track time, invoice the client. Now that we’ve covered our end-to-end solutions, let’s chat about how to start. The average business starts off by using about 5 apps in total, so take some time and think about the following: where are the largest problems in your process, what existing software do you already have in place, do you have experience implementing similar software? These questions will help you identify the right area to start. If you still aren’t sure, a good place for any business type is starting with CRM, and getting your contact database in order. Otherwise, below we’ll list out the most common solutions a company might start with. Simple Contact Management – Track all contact details, reminders, and communication history. Syncs with Google. CRM (Sales Force Automation) – Track all activities in your sales pipeline including reminders & communication. Project Management – Launch projects and organize activities for your team. Includes time tracking abilities. Estimates & Invoices – Generate quotes for customers & approve online, then invoice them and collect payment. Work Orders – Schedule jobs, assign to employees/teams, track materials and labor used, get customer approval. Help Desk – Generate tickets for support requests from email/website/phone, resolve issues, and track SLAs. Recruitment – Input details about job openings available, track applying candidates, and hire the right person. Kit Order – Create an order, track each vendor involved, send purchase orders, invoice the customer. Apptivo provides you with perfect CRM and other best apps for small business. While every company is different, each entry point has certain apps which integrate tightly, leading to a natural flow of apps to try out. Find your entry point in the chart below and check out the next solutions that users typically adopt. Note: “Fulfillment” refers to the order management right for your business type (either projects, work orders, orders, or kit orders). We’re always excited to learn about new types of businesses that use Apptivo, so let us know if your solution doesn’t fit into the above. We’d love to hear from you @ support@apptivo.com!.